I saw this on eBay last week. Isn’t it cute? I remember my capping ceremony. 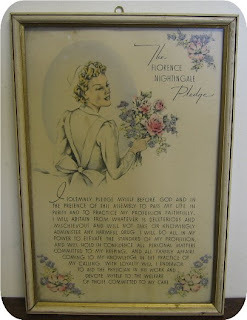 I stood in front of a crowded church while reciting the Florence Nightingale Pledge. It’s something that I will never forget. Looking back, I’m amazed that I ever got to take that pledge, or that I made it through nursing school. I went to nursing school in a small town in Southern Illinois. Racial tensions were high, and the Klu Klux Klan was in its glory. The schoolwork was hard enough, but imagine trying to get through your emergency room rotation as one of your teachers is bragging to the other faculty members about how she was going to crucify a Jew. I’ll give you one guess who she was talking about. This woman screamed at me in front of my classmates, and in her office behind close doors. She constantly told me that she would made sure that I never made it through nursing school. I quietly took her abuse. I was young, inexperienced, and scared, but I was determined to stick it out. I decided that I wasn’t going to give my teacher the satisfaction of running me out of town. Those events happened many years ago and I’m still standing. I am bulletproof and unbreakable. I am a real nurse. Iris from “Did I Just Say That Out Loud ??? ?” has started a meme which asks what makes someone a real nurse. I’ve posted my answers, and I hereby tag Kim at Emergiblog, Deacon Barry, Nurse William, and anyone else who wants to play. Real nurses can talk about all kinds of gross body fluids while eating a meal. Real nurses can tell a doctor what orders they need to write in a patient's chart while making the doctor believe that it was their idea to write those orders in the first place. Real nurses can run a three-minute mile while they are at work in two minutes flat. When real nurses get together, they grip about work. Sorry, but if you think that today’s hospitals are focusing on how to provide good quality care, you aren’t a seasoned nurse, and you are naive. Hospitals are running their nurses into the ground and real nurses know that hospitals are strictly profit driven. Real nurses are patient advocates. Thanks for playing, I can't wait to see what kind of answers we get. I, for one, am glad you made it through nursing school! I had an instructor named "Cinderella" (honest-to-God it was her real name!) who tried to get me, but the joke was on her. A real nurse looks at the arms of strangers in the mall and instantly assesses how easy it would be to start an IV in said arm. A real nurse has a bladder the size of a watermelon. A real nurse can wolf down an entire 3-course meal in 5 minutes ... while standing. A real nurse thinks nothing of using an emesis basin (unused, of course) for a dinner dish or a urinal for a flower vase. A real nurse can probably tell you how many years, months, weeks, days, and hours till they can retire. Can one be a real nurse without a pin? Can one be a real nurse without a pin? An interesting thought and a very good question! Summed up what makes a real nurse? The ability in the face of threats and intimidation regardless of the source to still stand their ground! A real nurse knows more than the doctor about pretty much everything. A real nurse doesn't let it show on her/his face how grossed out she/he is by cleaning up your vomit. A real nurse can do her/his job with the lights off and without making any noise. A real nurse knows the buck stops with her/him. A real nurse cares about the patient more than the rules. A real nurse makes you feel like you've just made a new friend. A real nurse can talk about all the embarrassing stuff (like pee and poo) without making you feel self conscious. A real nurse will go to bat for you and could potentially save your life. A real nurse knows his/her strengths and weaknesses and isn't afraid to call in someone else for something that isn't his/her specialty. I love real nurses. Thank you for all you do. A real nurse is able to stay calm among the most difficult and stressful of situations. A real nurse will stand up to what she/he believes should be done if it is in the best interest for the patient. Ooooo - great idea for a post! Thanks for the tag!!!!! Wow, I just had to get in on this topic. To me what makes a real nurse is how they can start to eat their lunch-get 2 bites down,get called away to go clean up their GI Bleeder for the 20th time, wash her hands and come back continuing where she left off with her food. Yea, its sick, but after a while you dont think twice about it..
Aha, tomorrow's post just manifested. Thanks for the tag. My mother and her sisters, all very close, were RNs, got their training and licenses in the 1920s and '30s when it was a four-year college course with lots of clinicals at the associated hospital. They and their families visited each other often, and I can tell you what it takes to be a Real Nurse: tremendous dignity and competence in almost everything, and a passion for laughter, giggles and good food. I admired them all so intensely. When several visited with my mom, I lurked behind a door or under the dining table to listen to their joy of being together. They talked a lot about their work, which sounded to me a fantastical world of incomprehensible words and low murmurs about doings I couldn't figure out. They each loved nursing. That defined them almost more than family or religion. So why is it that I never had the slightest interest in a nursing career? Beats me. I did start smoking because the aunt-most-admired did. A real nurse has compassion/empathy when she enters a room with a doctor who has bad news to share with a patient and she is able to dry the patients tears while trying to hold her own until she can get down the hall and out of earshot of the patient so she can cry.